Born Colchester 9th August 1933, married Eilish. Two sons, one daughter. Works in Collections:Sir David Frost;Colchester and Ipswich Museums; Epping Forest District Museum; East Contemporary Art Collection University Campus, Suffolk; Madison Museum of Fine Art, USA; London Electricity National Grid (commissioned). Publications: “Charles Debenham East Anglia” (by David Buckman, published 2000 John Samson & Co, Bristol; Chas Debenham “From the Other Side of the Street” Introduction by the artist published 2006 Firstsite. Works Reproduced: as above plus oil paintings in public ownership. Aged 14 Charles Debenham began evening classes at Colchester School of Art, training there as an illustrator full-time from 1948-53, teachers John O’Connor, Blair Hughes-Stanton, Hugh Cronyn, Carel Weight. In the early sixties he was appointed to the list of designers for The Crown Agents. His clients included Anglian Water, British Telecom and National Rivers Authority followed by National Power and National Grid for whom he designed a great many Visitor and Educational & Environmental Centres. At Earls Court Charles designed the Central Features for both The London International Boat Show and The World Travel Market. For London Electricity the costumes and giant floats for The Lord Mayor’s Show and Battersea Easter Parade. At St Paul’s Cathedral he designed The Royal Wedding (Charles & Diana) Exhibition. Charles was awarded top prize for his pavilion for Bowater, at The International Fair, Cairo 1976. He also designed the USA National Pavilion at Palais Sud, Paris 1980 and Basel Expo 1981. The Merchant Navy commissioned him to create their float for the parade to mark the 50th anniversary of the end of WWII. Information taken from: Who’s Who in Art 2012; David Buckman’s Artists in Britain since 1945; Chappel Galleries exhibition 2006. I first met Charles Debenham when we became fellow students at Colchester School of Art in the early fifties. The student numbers were relatively small and the Art School had a family feel about it. Charles, at this time, could often be found in the print room with an audience, observing him wood engraving to a high standard. Students would also follow his efforts at life drawing and painting. I remember in 1953 making a comment about Stalin's death – Charles said "It's alright Richard, he's dead, and you are still about and breathing, here and now!". A short reality lesson for a 17-year-old! I remember being impressed by his diploma thesis on Goya, which contained beautiful copied 'Disasters of War' prints, using pen and ink. I would say his work made a positive impression on all of us. I have recently been on several trips to Italy and Spain with Charles sketching and painting. Two years ago we went to Sicily and had an unfriendly encounter with a gang demanding money at a railway station in Noto. One member of the gang was left hors de combat by a sharp knock on the head by Charles’ walking stick! We survived and found ourselves at the police station looking at mug shots of possible gang members. Our hosts googled us and discovered that Charles had done work for the Queen Mother, and the next day Noto town invited us back to a Mayoral reception in the Town Hall. We were given a first-class meal and taken to see Noto's tourist areas. Charles insisted that we carried on with our sketching and drawing, the correct advice (as always). 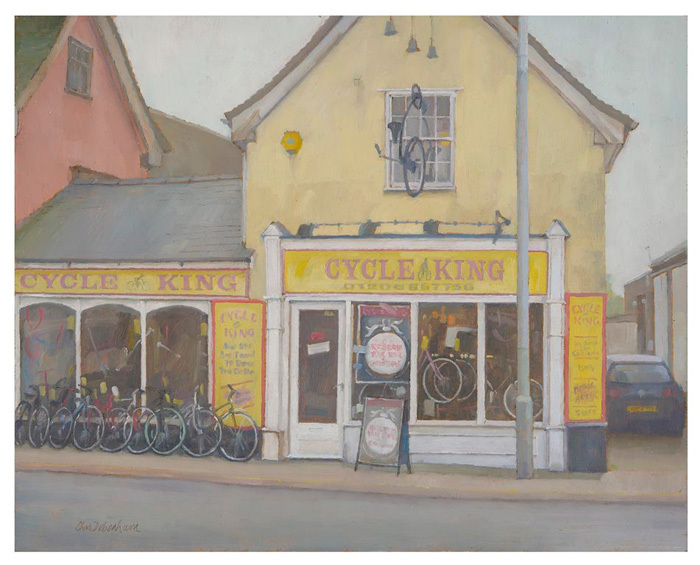 Charles' work is very evocative of urban and rural scenes, executed in oils. There is sometimes an element of humour in the images, or something that sparks an interest that is out of the ordinary. The subject matter is often views of Colchester that caught his eye and interest. Charles has always been professional in his approach to his own work. He has always had a disciplined attitude to work in hand; commissions, exhibitions, design work and the studio environment, which is all to his credit. He has a sense of fun which is happily married with a good business brain, complemented by his discipline and dedication.